Where to dine when the weather shines. It's hard to feel anything but relaxed on this pergola-shaded patio across from Green City Market. 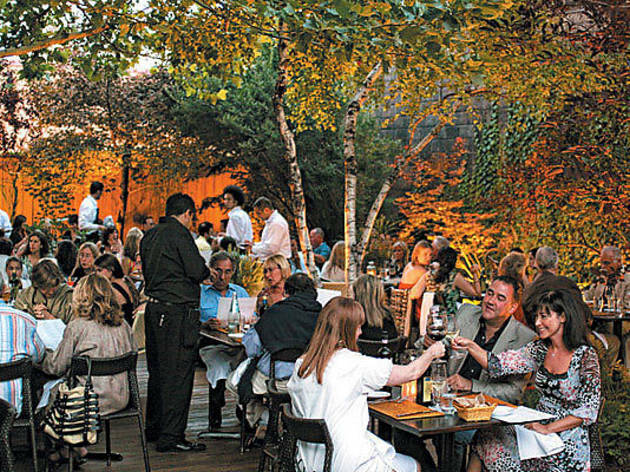 Simple, delicious Italian fare—and one of the city's most charming hidden patios. The only thing that could make these pizzas more organic is eating them in the great outdoors—streetside or on the back patio. You can get Geno Bahena's moles all over town—but no other spot has a patio this enormous. When the pizza ingredients are this stellar, even the Metra rumbling by can't disturb the peace on this sidewalk cafe. A tree-lined patio and a variety of bruschettas will take you straight out of Wicker Park. A couple of glasses of wine, and you'll almost be in the Italian countryside. If your idea of winding down from the day involves 12-year single malt and rubbing elbows with international businessmen, you’ll find all three on the seventh-floor patio lounge of this Park Hyatt stunner. Few things say summer to us as much as Hopleaf's serene back patio and a couple of Belgian brews. Giuseppe Tentori's food is complex and subtle. The restaurant's terrace is straightforwardly delightful. 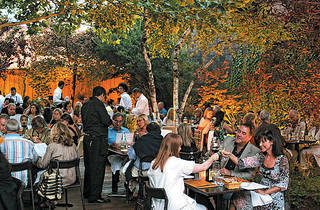 Coco Pazzo vet Tony Priolo's lush patio wins the Urban Oasis award. really.